According to Ferishta, in 682 AD, the Afghans , who had embraced Islam at that time , descended from their mountains and laid waste to the Kurram , Sheewuran and Peshawar. The Raja of Lahore, who was related to Rai of Ajmer, sent 1000 horse to annihilate Afghan invaders , but his force was defeated with severe losses. In second attempt the Raja sent his nephew with 2000 horse and 5000 infantry against Afghans. By this time, Afghans had procured reinforcements and their numbers had swelled to four thousand men, they marched against the Indian forces. For the next five months, seventy battles were fought between Afghans and Indians. Indians suffered greater losses and had to retreat to Lahore. In the following spring, Indians assembled the army again under the former general and engaged the Afghans between Peshawar and Kurram. Several indecisive battles took place. At the commencement of rainy season, Hindu forces retreated into the territories beyond river Indus , this induced the Afghans to return within their frontiers. Afghans were part of the expedition into India in 705 AD, when their contingent from Khurasan, then under the rule of Abdul Malik Hijjaj bin Yousuf joined Muhammad bin Qasim to Sind. In 10th century, some of the Afghans allied themselves politically with the Hindu-Shahi, rulers of Lahore, and received parts of Laghman for settlement , built a fort in the mountains of Peshawer, which they named Khyber, to protect the Punjab from raids. Under the Samanids , Afghans formed a buffer state between the Kingdom of Multan and Lahore , thus confining the Samani inroads to Sindh. During Alapatgin government at Ghazna, when his commander-in-chief Subuktigin raided Laghman and Multan, the Afghans of those parts sought help from Raja Jaipal who appointed their chief , Shiekh Hamid Lodi, viceroy of Wilayats of Lamghan and Multan. Shiekh Hamid appointed his own men as governors of those districts , and thereby the Afghans gained political importance; their settlements stretched southwards from Laghman to Multan, incorporating the tracts of Bannu and Dera Isamel Khan. Hamid, however, went over to Subuktigin and thus saved his own territories from invasion.. Utbi tell us in his book Kitab-i-Yamini that Subagtain enrolled large number of Afghans in his army. There was a strong Afghan element in the forces of Sultan Mahmud of Ghazna, the son of Subaktagin. Sultan Mahmud had procured the throne from his half-brother Ismael with the help of Afghans who were attached to his household from his mother side (Mahmud's mother was daughter of a chief of Zabul, while Ismael's mother was daughter of Turkic Alptagin). Afghans were part of all the raids of Mahmud on India. The Dilazak tribe of Afghans, who were supporters of Mahmud, settled in Bajaur and Peshawar valley and reduced the native Indian population to servitude. Shahabudin Ghori also depended on Afghans and Khiljis for his military campaigns. He had 12,000 experienced Afghan horsemen under their chief Malik Mahmud Lodi in his army in his third campaign to India against Rajputs under Pritviraj Chauhan. On his way back from Hindostan, Shahabudin Ghauri founded the fort of Sialkot and appointed Malik Shah Lodi, brother of Malik Mahmud to populate this town. The ascendency of Lodis dates back from that time.Serving thus in the army of Shahabudin Ghori , the Afghans rose to power and settled over a large tract of land. In Shahabudin Ghauri's times, Mangal and Hani tribes of Afghans got settled in the fertile tracts of Bannu while Prangi, Suri and Sarwani tribes of Afghans settled in modern day districts of Dera Ismael Khan and Tank. An Afghan chief Ali Kirmakh was appointed governor of Multan in 1186-87 A.D by Ghauri. After death of his master, Qutbudin Aibak also extended his patronage to the Afghans. His successor Iltimish utilized Afghan support to counteract the rebellious Turki nobility. Yet the Afghans didnt figure any where amongst the lines of nobles during his reign. Minhaj al-Siraj Juzjani in his Tabqat-i-Nasiri tell us that Sultan Balban employed large number of Afghans in his army. He brought areas known as Kohpaya.Bharatpur, Dholpurand parts of what became Jaipur and Lawar, under the sword with the help of a body of Afghans numbering 3,000. From about the same time fortresses on Mongol frontier had begun to be garrisoned by Afghans. Balban also garrisoned forts in the Mewati territory with Afghans, to keep the road between Delhi and Bengal open. Afghans were also settled in Awadh to keep its non-Muslim population in check. Balban continued to use Afghans after he became Sultan. They were deployed in the strategic areas of the Ganges-Jamuna Doab soon after his accession and the further a field in the areas of Haryana and western Punjab.Old military cantonments were refortified and Afghans were given charge of these strategically important areas. A decade after this deployment, Afghans controlled the cantonments that encircled the capital of sultanate. In the Khilji revoultion of Jalaludin , Afghans sided with the Khiljis who were also from Afghanistan and had Afghan manners and customs. Sultan Jalaluddin Khilji needed the support of Afghans to defend the North-west frontier against the Mongol invasions , to conquer the unconquered regions of India and to suppress the internal rebellions. His successor Alaudin Khilji not only enrolled large number of Afghans in the army but also admitted them in his nobility. Among the leading Afghans, who enjoyed the status of noble , were Malik Ikhtiyar Yal Afghan and Malik Mukh Afghan. The former continued to hold important position up to the reign of Sultan Qutbuddin Mubarak Shah Khilji. Afghans made a marked progress during Muhammad bin Tughlaq's reign, Malik Ikhtiyar-ud-din Yal Afghan who had been noticed earlier in connection with nobility under Ala-ud-din Khalji continued to hold the position under Muhammad bin Tughlaq. Malik Makh Afghan, his younger brother was sent by Ghiyas-ud-din to the expedition against Warangal in A.D 1321 under the leadership of his son Ulugh khan. Other notable Afghans of Muhammad bin Tughlaq were Malik Khattab Afghan, Jalhu Afghan, Tughal-al-Afghan, Bahram Afghan, Gul Afghan, Mandi Afghan and last but the least Malik Shahu Lodi. His successor Firuz Tughlaq continued to patronize the Afghans and prominent among them were Malik Afghan, Malik Daud Khan Afghan, the muqti of Bihar, Malik Muhammad Shah Afghan, the muqti of Tughluqpur, Malik Bali Afghan and Yasin, son of Malik Shah Afghan. During Muhammad bin Tughlaq reign, the lower grade officers came to be called Sadah. Sadah or hundred (centurion) was the term used in Mongol military for one who commanded a hundred men.. But in India, the word sadah began to used as a territorial divisions , to signify a hundred villages. The Sadah amirs were, either Mongols or Afghans.The Mongol and Afghan Sadah amirs behaved differently than much loyal Turkish and Hindustani nobles. Due to position as Sadah amirs, large number of Afghan zamindars emerged during the latter part of 14th century. One of the Sadah Amir, Malik Mukh Afghan was in possession of 2,000 villages in Deccan and led the revolt against Muhammad bin Tughlaq in 1344 AD. He was declared Sultan by the rebels and he assumed the title Nasir-ud-din Shah. Nasir-ud-din Shah was an old man and hence he resigned from the post and the nobles nominated Hasan Gangu or Zafar Khan as the new chief under the title Abul Muzaffar Alauddin Bahman Shah. Thus Afghans lost the golden opportunity of establishing new Afghan dynasty in 14th century. In 1341 Malik Shahu Lodhi, an Afghan noble,who had considerable following of his own tribe, killed Bihzad, the governor of Multan and assumed sovernighty. When this news reached Delhi, the Sultan Muhammad bin Tughlaq assembled large army and set out to crush him. He had hardly covered two or three stages, when he heard that his mother had died but sultan continued his march. When he reached Dipalpur, he learnt that Malik Shahu had fled to Roh. The Sultan thereupon returned to his capital and issued orders for the wholesale arrest of Afghans in his empire. Malik Khattab Afghan was the governor of fort of Rapri during the reign of Sultan Muhammad bin Tughlaq. Supported by some 300 Afghan followers, he held the ground against a large number of powerful and recalcitrant zamindars, who had combined and laid siege to fort Rapri. But Sultan didnt have faith in him and upon the rebellion of Malik Afghan, he was thrown into prison along with other Afghans in 1345 AD. But shortly after he was released and reinstated. On the death of Sultan Muhammad bin Tughlaq, he supported Khwaja Jahan Ayaz but upon the latter's submission, he also offered allegiance to Firuz Shah Tughlaq. Qazi Jalal , famous Afghan chief, was posted with his Afghan followers in Gujarat. He put his claim to kingship over the territories of Gujarat and and defeated Muqbil, the deptuty governor of Gujarat. His associates in rebellion were Jhallu Afghan, Bimbal and Jalal Ibn Lala Yal. Sultan Muhammad Bin Tughlaq sent troops against him but Qazi Jalal defeated them. So Sultan personally went against rebels and Afghans suffered a severe defeat at the hands of the royal army , their leader Qazi Jalal was killed in the battle. There were large number of Afghans in the Imperial service during Feroz Shah Tughlaq's period.In 1376-1377 the province of Bihar was given to Malik Bir Afghan .Malik Bir was succeeded on his death, by his son, Daud Khan. In 1377 Malik Bulli Afghan was appointed to the governor of Ikhal . Malik Muhammad Shah Afghan, was governor of Tughluqpur and he was given task of keeping eye on turbulent zamindars of wilayat of Etawa.On his death, Sultan allowed his son Yal Khan to retain his father's iqta. Malik Mardan Daulat , the muqta (governor) of Multan had employed a large numbers of Afghans in his army. Among these Afghans was Malik Behram Lodi, the grandfather of Bahlul Lodi. Soon after the death of Firuz Shah Tughluq in 1388A.D. the disintegration of Empire started. Zafar Khan Lodi and his sons Sarang Khan and Iqbal Khan became very powerful in the Delhi court. Sarang Khan became the Governor of Dipalpur in 1394 A.D. Sarang Khan Lodi occupied Lahore, which increased his prestige.Then he attacked Khizr Khan in 1395 A.D. and captured Multan and Uch. 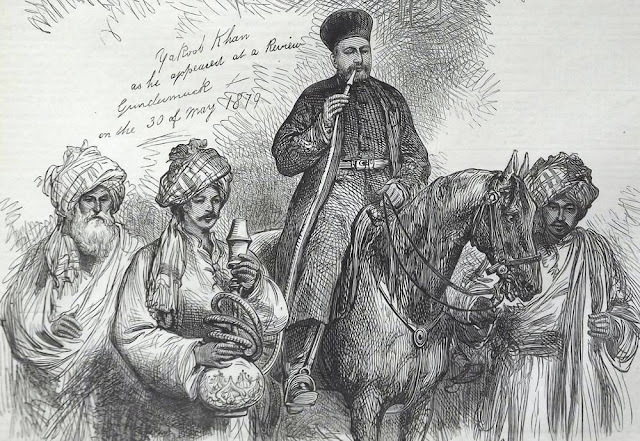 Khizr Khan ran away to Central Asia and joined the service of Amir Timur. Amir Timur deputed his grandson Pir Muhammad Jahangir to march on Hindustan in 1397 A.D. Amir Timur fowled him in 1398 A.D. Pir Muhammad Khan appeared before the Fort of Uch. Malik Ali, the deputy of Sarang Khan, decided to resist. Pir Muhammad besieged Uch and ultimately the fort was captured. Then Pir Muhammad proceeded towards Multan where Sarang Khan resisted and the siege lasted for six months.The news of the arrival of Amir Timur near Tulamba dismayed the people of Multan. The Multani army was defeated and Sarang Khan was captured. Multan was occupied in 1398A.D. Later Sarang Khan was killed under the order of Amir Timur. In Meerut, Timur's soldiers indiscriminately plundered the houses of the common masses. This brutal treatment greatly perturbed the local population, including Hindus and Afghans. They resented this highhandedness and consequently rebelled under the leadership of Ilyas Afghan and Ahmad Thanseri. Equally assisted by the Hindus, the Afghans offered tough resistance to the invading army. Timur besieged the city and a fierce fight took place. At the end the invading army captured the city in January 1399. On his way, Timur held his court in Lahore and appointed Khizr Khan Governor of Lahore, Dipalpur and Multan. Being a viceroy of Timur, he availed of the opportunity and defeated Malik Iqbal Khan , alias Mallu Iqbal, (brother of Sarang Khan) in 1405 AD. In 1412 Daulat Khan Lodi, the faujdar of Doab, won the support of most of the nobles and managed to occupy the Delhi throne. He sent several expeditions to establish the imperial hold over Punjab but in vain. He had defeated Bairam Khan, naib (second in command) of Khizar Khan on 22 December 1406, and then established himself at Samana. But on the approach of Khizar Khan's army, majority of his soldiers deserted and went to the enemy camp. With the passage of time, his own people, for instance Ikhtiyar Khan also joined the army of Khizar Khan. At last in March 1414, Daulat Khan Lodi was besieged at Siri by 60,000 strong army of Khizar Khan. The unrelenting process of desertion gravely weakened his position and at the eleventh hour too some of his officers treacherously deserted and went to the side of Khizar Khan. In this way he was forced by circumstances to surrender. On May 28, Khizar Khan Captured Delhi, imprisoned Daulat Khan Lodi and founded a new dynasty known as the Sayyed Dynasty of India. According to historian Khafi Khan, Khizr Khan belonged to Afghan nation and was incorrectly called a Sayyid. 8- Rita Joshi, "Afghan nobility and the Mughals"